Skeletons start as a bone and a drive to rebuild. One bone pulls another to it and if they are close to a fit, the first bone looks for a third, then a fourth… The first bone prefers the bones it knows when it can get them. But sometimes it has to improvise. In that case, bones from other being (or even other species) are brought together, but always in an attempt to recreate a creature that matches the ones that first bone came from. The bones retain the memories and skills of the creature they were in life. All a skeleton needs to take advantage of any skills it might have is the meat to make it happen. Most skeleton’s first priority is to get some eyes. Without eyes, a skeleton can sort of tell where a person is and what motions and postures they are making, but they cannot see.Next is a tongue, which gives it speech (it will need lips to make some sounds like p, b, and m). A brain will make it smarter. Skeletons are drawn to good-looking and/or unusual parts. These flashy body parts tend to rot quickly. Skeletons who have found brains will try to preserve these parts by sun-drying tongue and lips, and pickling eyes, inner ears and brains. These parts are saved for when they are needed. 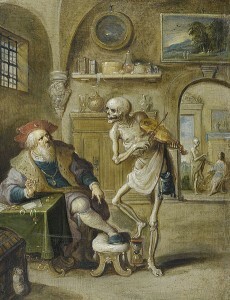 This skeleton must have been a bard. So you will need to stat up a skeleton that gets ahold of bones or parts that had a class when they are alive because now the skeleton has that ability too. Without a spellbook (and eyes), magic user spells can be cast only once each (if they were memorized and unused when the original owner of the part died). Skeletons made with cleric bones might be able to pass for the cleric once or twice, unless that god knows for sure of the cleric’s passing. If a skeleton is very successful at rebuilding a body, it might pass for the living to the careless observer. This is what they want to do, because if they are taken in to society, they can kill covertly and effectively, thus getting them more parts they want. Question: if it gets all its flesh it needs does it move up to being a ghoul or a ghast or something? As always, I leave it to the DMs. I suppose that could work, although I am not sure I endorse the hierarchy of undead any more than I endorse the rainbow of dragons. Maybe if they gather enough flesh they are more like Firefly’s Reavers. Wow. Just wow. Nightmares are coming tonight!